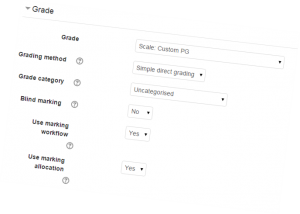 Feedback Studio only works with values so the PG Scale requires a few extra steps in order to calculate and display accurately to students in Moodle Grades. Create a rubric that returns a value (ideally an integer) between 1 & 16 which is then displayed as PG Scale point where the scale has been attached to the assignment. Grade using percentages and adjust the course settings to use Moodles Letters. The PG Scale and Course Letters have been adjusted centrally to make it easier for colleagues to adopt their preferred method. The available Scales can be found by going to Grades>Scales. As tutors you can also create your own module specific scale for use for direct grading. –Apply other settings as appropriate. Importantly one should set the Max Mark for the assignment to 16. Moodle calculates scale values for aggregation by dividing the single scale point by total number of points on scale so a P3 would be calculated as 9/16, which is then converted to percentage e.g. 56.25%. This is not the associated range for a P3 (60-64.9%) but where a single type of assessment is used aggregation and display works fine. Letters are a simple way of displaying percentages with an associated letter. Their use is via the Course Grade Settings where the Grade Display Type should be switched to Letter. 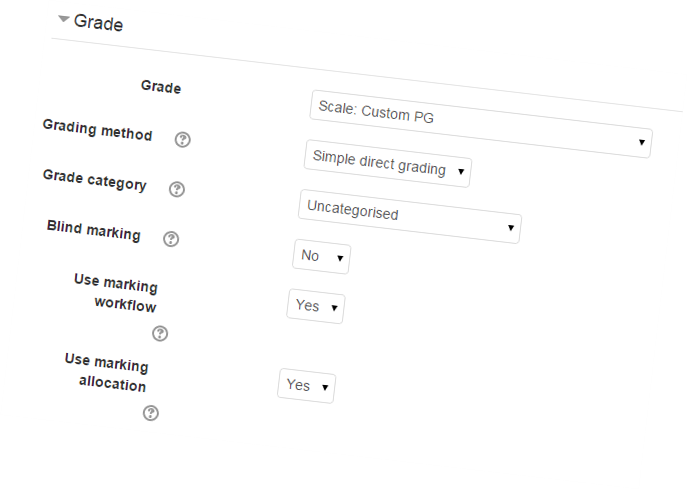 The screencap below shows the PG scale point boundaries and unlike a typical Moodle scale here we are able to implement uneven grade bands as we choose. If you were using multiple forms of assessment e.g. 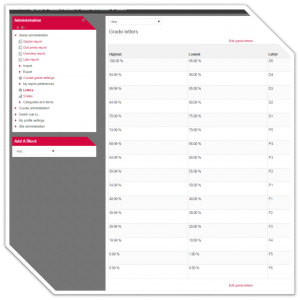 essays and quizzes, aggregation and weighting is easier and more accurate. 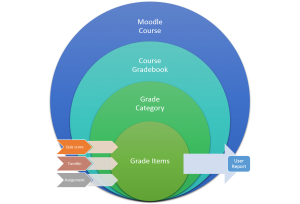 Question: have you read what is explained in the associated post each time a gradable activity is added to Moodle a new grade item is created ready to receive data?